Why do traffic engineers seem to like one-way streets so much? The AASHTO Green Book points out a handful of efficiency advantages . By removing the delay caused by left-turning cars, we increase traffic capacity and speed. Fewer intersection conflicts means more efficient signal timings and, in theory, fewer and less severe crashes (e.g. by eliminating head-on crashes). Medians are no longer necessary, so you can often fit in an extra lane of through traffic, which further increases capacity and speed. More mobility with better safety? What’s not to love? Beyond the abundant advantages, AASHTO lists a few disadvantages as well. There is the potential for increased travel distances in cases when you have to travel almost around a whole block to reach your destination. When all lanes begin to back up at traffic lights, emergency vehicles may be blocked. Lastly, one-way streets may confuse visitors. Given AASHTO’s list of pluses and relatively few minuses, it makes sense why so many of our streets send traffic in just one-direction. Then again, it’s not hard to argue that what AASHTO deems an “advantage” might be the opposite. If I lived or worked on a one-way street, I’d be pretty hard-pressed to believe that more cars moving at higher speeds is necessarily a good thing. Appleyard’s early studies found many residential livability advantages on the two-way streets, but the one-way street he investigated had far more traffic than the two-way comparisons . Denver converted a handful of one-way pairs to two-way operation in the early 1990s and found that residents preferred the change . A recent case study out of Louisville looked at a handful of one-way to two-way conversions and found significant increases in pedestrian traffic, property values, and business revenue . These benefits were accompanied by a significant decrease in crime. Other cities such as Charleston, SC and Lubbock, TX also found success in terms of two-way streets helping downtown revitalization [5, 6]. Such livability benefits are all well and good, but are they worth the increased road safety risks that AASHTO made clear? The research is beginning to suggest that the safety answer isn’t clear cut. Lubbock found no significant change in terms of traffic volumes or safety . Another study from Jerusalem also found no difference in road safety . Despite similar traffic levels on the Louisville conversions, crash rates dropped with the two-way streets . Moreover, child pedestrian injury rates on one-way streets have been found to be more than double the rates on two-way streets . More research is needed on the safety outcomes. However, it is also interesting to ask why the safety benefits of one-way streets be overblown. First, there are likely to be differences in driver behavior, most notably with faster speeds on one-ways. It is pretty easy to understand see why slower traffic – despite the noted increase in conflict points – might help reduce crash severity. Another ITE guide even says the following regarding the safety of one-way streets: “one-way pairs with good signal progression and high travel speeds seemed to elicit red-light running behavior” . The image below comes from the ITE Traffic Engineering Handbook. It makes the case for better safety on one-ways by depicting the number of conflict point at an intersection for a two-way street as 32 and for a one-way street as only 5. This is a stark difference that could theoretically result in better safety. Beyond the fact that conflict points are not often well correlated with actual safety outcomes , the bigger issue is that they are comparing apples and oranges. This diagram compares an intersection where all four-legs have two-lanes to an intersection where all four-legs have one-lane. In reality, the one-way streets would have at least two lanes, if not three as in the image from Denver above or in cases where the median is removed. One-way streets with multiple lanes is a fairer comparison that would substantially increase the number of potential conflict points and deem the comparison in the image below as meaningless. Moreover with regard to conflicts, AASHTO even suggests converting from two-way to one-way operation in situations where an urban street has too many pedestrian-vehicle conflicts . The reduction in pedestrian-vehicle conflicts is supposedly derived from a simpler set of intersection movements. The real reason for the reduction of pedestrian-vehicle conflicts might be even simpler: fewer pedestrians wanting to cross the street in the first place. So after all that, the only definitive advantage left for one-way streets is increased traffic capacity. However, this point is also up for debate. Taking into account the decreased accessibility of circuitous routes, one paper found that drivers make significantly more turning movements and travel greater distances given the same origins and destinations in a network dominated by one-way traffic patterns . Another more recent paper suggests that a network of two-way streets actually has a greater trip-serving capacity – particularly for trips less than 5 miles – as compared to a network of one-way streets . When also prohibiting left-turns in the two-way network, this capacity advantage of the two-way network included longer trips as well. Not only do one-way streets hinder accessibility and livability, but the traffic engineering benefits don’t necessarily seem to hold. While one-way streets are still needed when relatively narrow cross-sections prevent two-way traffic, in most other urban contexts, it is hard to imagine why so many cities continue to preserve one-way streets. Some cities are changing their ways. 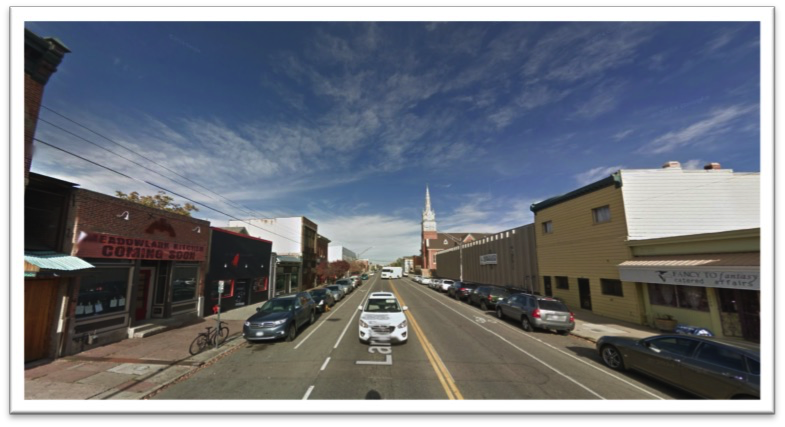 The before-and-after images at the top are from Larimer Street in Denver where a mile-long stretch was recently converted from a one-way into a two-way. Instead of three high-speed lanes heading toward downtown, there is now one lane in each direction with accompanying bike lanes. With noticeably slower traffic and more active transportation use along this corridor, it makes sense why there so many new businesses seem to be popping up, especially when compared to the parallel streets that remain focused on one-way traffic. It might be time for cities to find a new direction – and more research is needed – but it seems like this this new direction will run both ways. AASHTO, A Policy on Geometric Design of Highways and Streets. 2011, Washington D.C.: American Association of State Highway and Transportation Officials. Appleyard, D. and M. Lintell, The Environmental Quality of City Streets: The Residents’ Viewpoint. Journal of the American Institute of Planners, 1972. 38(2): p. 84-101. Robert Dorroh, I. and R. Kochevar, One-Way Conversions for Calming Denver’s Streets, in ITE International Conference. 1996, Institute of Transportation Engineers: Las Vegas, NV. Riggs, W. and J. Gilderbloom, Two-Way Street Conversion: Evidence of Increased Livability in Louisville. Journal of Planning Education & Research, forthcoming. Baco, M.E., One-Way to Two-Way Street Conversions as a Preservation and Downtown Revitalization Tool: The Case Study of Upper King Street, Charleston, South Carolina, in Historic Preservation. 2009, Clemson University and College of Charleston: Clemson, SC. Hart, J., Converting Back to Two-Way Streets in Downtown Lubbock. ITE Journal, 1998. August. Hocherman, I., A.S. Hakkert, and J. Bar-Ziv, Safety of One-Way Urban Street. Transportation Research Record, 1990. 1270: p. 22-27. Wazana, A., et al., Are Child Pedestrians at Increased Risk of Injury on One-Way Compared to Two-Way Streets? Canadian Journal of Public Health, 2000. 91(3): p. 201-206. ITE, Toolbox on Intersection Safety and Design. 2004, Washington, D.C.: Institute of Transportation Engineers. Jacobs, A.B., E. MacDonald, and Y. Rofe, The Boulevard Book: History, Evolution, Design of Multiway Boulevards. 2003, Cambridge, MA: The MIT Press. Walker, G.W., W.M. Kulash, and B.T. McHugh, Downtown Streets: Are We Strangling Ourselves on One-Way Networks? Transportation Research Circular, 2000(501). Gayah, V.V. and C.F. Daganzo, Analytical Capacity Comparison of One-Way and Two-Way Signalized Street Networks. Transportation Research Record, 2012. 2301: p. 76-85. ITE, Traffic Engineering Handbook. 5th ed. 1999, Washington, DC: Intstitute of Transportation Engineers. One may want to consider narrowing the context of when one-way pairs are good or bad. See last comment in Marginal Revolution covering similar topic. Whether or not one way streets are appropriate depends to a large extent on the context. If the area in question is the “destination” then one way streets may certainly not be appropriate. However, if an area is overwhelmed with traffic that is destined through that area and an alternative route or bypass is not feasible and widening of an existing roadway would destroy the character of the area, then short segments of one way streets can perhaps provide the needed capacity without adding pavement or removing buildings. St. Michael and Lindstrom are two examples of this in Minnesota; Dana Point in California is another.